That just looks like heaven. Hope it tasted as good as it looks. ewww that looks gross-give me more of the mac and cheese pleeze! Looks good. Now I am ready for lunch and it is not even 10 am. That’s a table cloth to die for – love all things checked and the stars (especially the red ones) are a real bonus…. but I think I’d skip the nosh! ummm. 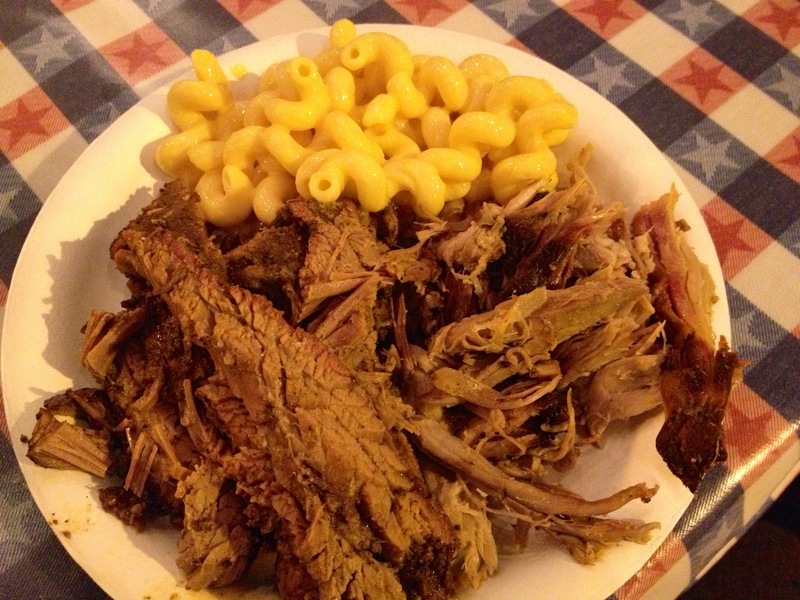 Not to sound like a BBQ snob, but you need to try southern BBQ from Alabama. We provide red and white sauce and slaw for the old schooler’s. If you ever want to try real BBQ let me know , I will provide you with excellent selections. If you prefer ribs…you cannot go wrong with Dreamland BBQ. They are world famous and the restaurant in Birmingham will ship it to you over night. Be sure to ask for the sauce and white bread. Granted, I wasn’t there, but that looks like a paltry excuse for a smoke ring.